One of my research projects-in-progress for Pocketmint has been a comprehensive chart of airline bag fees. Since I can’t keep straight who charges what for which item of luggage, I figured other people must be having the same problem. Turns out someone else saved me the trouble! Travel search engine Kayak (of which I am very much a fan) has a chart that shows not only bag fees but also charges for food, pets, unaccompanied minors, seat assignment, and legroom. The chart appears to be regularly updated; as of this writing, none of the entries are more than a week old. One interesting thing I learned from this chart is that Southwest offers free service to unaccompanied minors. Claire’s first solo trip this summer, to visit her aunt and uncle in Eugene, was in dire jeopardy because the unaccompanied minor fee would have added $150 to the ticket price. (We worked out a way to drive her instead.) 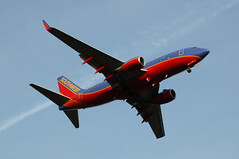 Southwest doesn’t fly SEA–EUG, but we may send her to family in Austin next year, so that’s good to know. Since Southwest is the one airline that has been protected from high fuel prices, this may even still be relevant a year from now. Also, Airfare Watchdog has a list of other fees to watch out for. Did you know that many airlines now charge for reservations made on the phone or in person? Luckily for me I actually prefer the Internet. Sometimes I wonder if budget airline tickets actually work out more expensive than going with a larger airline – once you add in taxes, baggage fees and booking fees,etc, it seems like you could have already paid the full price fare with a larger airline. I also think that because budget and no-frill airlines usually fly into secondary airports outside the city of your actual destination (they do here in the UK/Europe, anyway), you then have to pay for transport to and from your actualy destination, which adds even further to the price. The other point, about secondary airports, is sometimes a factor, and sort of has to be evaluated on a case-by-case basis. Free food is not necessarily the norm in Europe anymore, unfortunately. When I flew bmi (British Midland) on a hop between London and Scotland, you had to pay for food. However, I noticed that if you were a member of the bmi frequent flyer club and had some status, then you got a free sandwich and a slightly better checked baggage allowance. I’m also pretty sure that if you are a status member of *any* Star Alliance frequent flyer club, you don’t have to pay United (part of SA) to check baggage even if you’re only flying within the continental USA. While this may not directly help people who fly infrequently, it may be still worthwhile to stick to a group of airlines (Star Alliance, OneWorld) in case there are any cost-reducing side benefits available. On the other hand, this has to be balanced with buying the cheapest fare available. I agree with checking out secondary airports, but they aren’t always problematic or much more expensive. Berlin has 2 or 3 airports, for instance, and the main one is a quick bus trip into the city – but even the ‘distant’ one is only 45 minutes on an inexpensive train. The difference in price is likely to be less than 1 Euro.